Built in 1911 as a cozy bungalow and later converted to a two-story colonial revival home, Adams House in Austin, TX has been lovingly restored and preserved to maintain its original pine floors, soaring ceilings, slate flooring and sash windows. Converted into a charming bed and breakfast in 1997, the Adams House Bed and Breakfast gained a Historic Landmark status in 2010. Adams House Bed and Breakfast offers well-appointed three guest rooms and two luxury suites with antique furnishings, private bathrooms with deep soaking tubs and sunny porches with glorious garden views. Adams House Bed and Breakfast offers five beautifully appointed guest rooms and suites with country-style décor and antique furnishings, comfortable beds dressed with luxury linens and plush pillows, additional sleeper sofas for extra guests and private bathrooms with showers/deep soaking tubs, thick towels, and designer bath products. Sunny porches offer lovely views over the gardens. Modern amenities in all rooms and suites include central air-conditioning, heating, and ceiling fans, complimentary wireless Internet, hairdryers, complimentary bottled water and access to television with cable channels and a DVD player in the Inn’s common living room downstairs. The Elisabet Ney Room features a queen-size sleigh bed dressed with luxury linens and plush pillows, and a private bathroom in the hallway with a deep soaking bathtub –and –shower combination, thick towels, and organic bath products. The second-floor room also has a large walk-in closet, a work desk, and chair. Located on the second floor of the main house, the Hyde Park Room features a pine queen-size poster bed dressed with luxury linens and plush pillows, an en-suite bathroom with a walk-in shower, pedestal sink, thick towels, and organic bath products, and a chaise lounge, walnut antique chest, and armoire. Two walls of historic double hung windows flood the room with natural light and boast beautiful views. A complimentary breakfast is served in the mornings and includes healthy fare such as homemade granola, yogurt, fresh fruit, home-baked muffins or bread, an egg dish, freshly squeezed juices, coffee, and tea. Adams House Bed and Breakfast offers amenities and guest services such as a complimentary breakfast served every morning in the elegant dining room, a communal living room with comfortable sofas and armchairs, a television and DVD player, and free wireless Internet throughout the property. 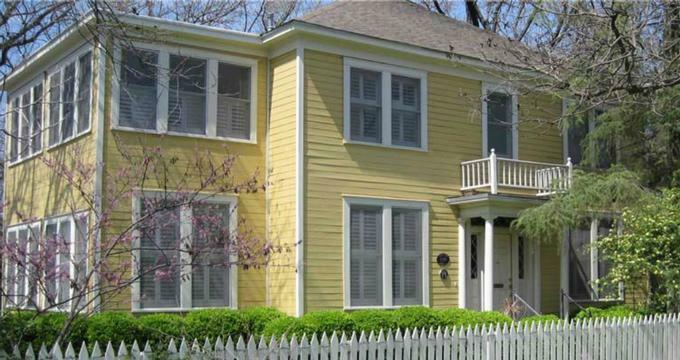 Adams House Bed and Breakfast is located in central Hyde Park and is ideally located for exploring the beautiful tree-lined streets and historic buildings of the city on foot or by bicycle. The Inn is close to many museums, theaters, excellent restaurants and over 200 live music venues and just a few miles away from the University of Texas. Notable attractions in the area that are readily accessed from the guest house include the Elisabet Ney Museum and Shipe Park, while slightly further afield lies San Antonio and the Alamo, the pretty Riverwalk, Fredericksburg, and the Guadalupe River. Don’t miss a visit to Lockhart, the BBQ capital of Texas.